Personally, I think that if you’re afraid of blood it’s time to get your terror priorities in order. Blood is just a fluid that delivers life-giving oxygen to every part of your body. I ranked it at 86 in my list of “Things to Be Super Scared Of,” right between carbohydrates and being made to watch a movie sequel where they couldn't get any of the original actors to reprise their roles. It was a dark and spooky coronation. Queen Mary I, daughter of King Henry VIII and Catherine of Aragon, became the ruler of England, Ireland, and bathroom mirrors. "From this day forth," she announced, "if you go to your bathroom mirror and say 'Bloody Mary' three times, I will appear and tell you what a disappointment you are and maybe claw at your faces. Especially at slumber parties, but also at summer camp." "Hooray! Long live the queen!" shouted the people of England and Ireland, although none of them owned bathroom mirrors. "Furthermore!" said Queen Mary I, as she was not quite finished. "Did you know that if you dip a sleeping person's hand into warm water, she will pee her pants? I decree that we try it on Melissa tonight and see what happens." "Hooray!" the people of England and Ireland shouted again, in agreement that Melissa would definitely be the one to fall asleep before midnight. "I also decree!" Queen Mary I continued, "that we should eat pizza and Twizzlers after my parents go to bed. But let's not get onions on the pizza because that's gross." The people of England and Ireland could only shout hooray again, overjoyed at the bounty of onion-less pizza and strawberry-flavored confection. Then, Queen Mary I and the people of England and Ireland settled in to watch a super spooky movie with all the lights off. Years passed. Queen Mary I became ill, as people in the 16th century tended to do. "Ew, you guys," she proclaimed. "I ate way too much pizza, and I'm like totally nauseated. Sorry to be a complete buzzkill." And then she died during a rousing game of "Light as a Feather, Stiff as a Board," and nobody was psyched about that one bit, except her sister Elizabeth. One night at summer camp all those years later, an 11-year-old girl was lying awake in the darkness thinking about things. "What do 11-year-old girls think about?" you might be asking. Well, some think about boys. Others think about hairdos. And some 11 year old girls think about the best strategies for beating BioShock Infinite on 1999 mode. I guess what I'm saying is that 11-year-old girls think about a lot of different things. But this 11-year-old girl was lying awake in the darkness debating whether or not she should say "Bloody Mary" into the mirror three times because one of the other girls in Cabin 12 told her that if she did a demon would appear and drag her to hell, etc. The story had gotten blown quite out of proportion over the years. Finally, the 11-year-old girl got out of bed. She felt her way around the other bunk beds in the darkness, listening to the sleeping breath of her cabin mates. She went to the mirror in the cabin bathroom (it was a very modern camp with all the amenities). She turned on the light and looked into the mirror. 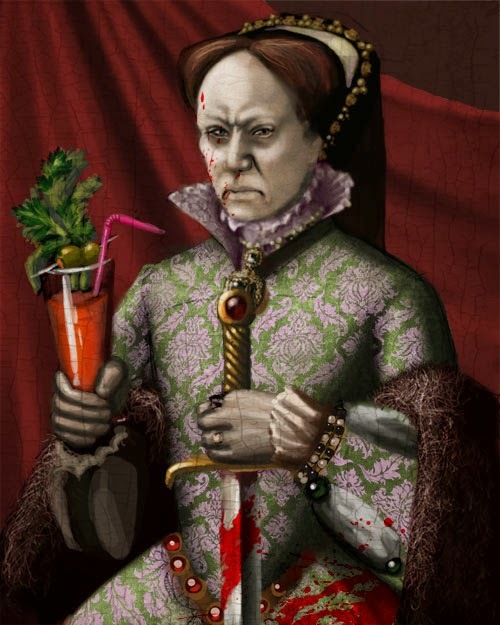 "Bloody Mary," she said once. "Bloody Mary," she said again. "Bloody Mary," she said a third time. "Oh," said the girl. "I was expecting something scarier to appear." "Like Anne Boleyn?" Queen Mary I asked. "Like dying without giving birth to a child to succeed you?" "What were you expecting then?" asked Queen Mary I. "I don't know," the girl said, "A demon with blood shooting from its eye sockets?" "OOH," said Queen Mary I. "I have an idea of a thing that will totally scare you." And she dared the girl to call a boy she liked and hang up.